To meet the needs of businesses to accomplish higher quality of work in a shorter period of time, Canon provides a compact solution with a device featured in the Canon imageRunner Advance C5030 Printer review. This printer, with its new platform, allows members of a workgroup to work as a team. It, also, provides simpler working operations to let a user accomplish his tasks of either printing, copying, scanning and faxing, with ease. This Canon imageRunner model is compact and has an appealing design that is simple to use and operate. It is created with an advanced architecture that makes use of two processors to provide excellent multifunctional performance. It makes use of a control panel that you can slide and tilt to let the unit be more comfortable to use. It includes two types of menus. You can gain access to the printer’s functions by means of the main menu. On the other hand, you can go through the printer’s regular tasks through the quick menu and with just a touch of a button; a Workflow Composer service simplifies frequently used functions. It provides an advanced workflow with its incorporated features. An auto document feeder that is capable of handling 100 sheets, can transform documents into digital files in rapid speeds, both in duplex and simplex. It comes with modular in-line accessories that provide you with professional documents like an inner finisher that allow you to staple 50 sheets. It has the brand’s new integrated document sharing solution in the presence of the Advanced Box. This enables several users to work as a team. Here, you can store files under shared folders and you gain access to them from other locations such as a PC and other imageRUNNER ADVANCE systems across the network. You can, also, have direct access to the printer’s functions wherever you are, whether from your desk or any imageRUNNER model. You can set in tracking information in a document by means of the Document Scan Lock and Tracking. This way, you can keep track of the original and can prevent unauthorized copying and scanning of documents. With data encryption and erase options, you can cover up information before it is written on the hard drive. You can overwrite it to remove it, permanently. This printer integrates advanced technologies like the brand’s pQ toner that lets it create high quality images. This, together with an advanced rapid fusing system, helps in reducing overall consumption of energy. It is designed with 100% recyclable materials. With the life cycle assessment system it comes with, it lessens CO2 emissions by more than 30%, as compared to earlier models. The abovementioned qualities gives its energy efficiency, thus, making it Energy Star qualified. It has printing features, some of which are the following: duplex printing, Secured Print, collating, booklet printing poster printing, watermark, auto detect, toner reduction, and header/footer printing. Its fax features include fax forwarding, delayed send, selecting telephone line when sending, indicating sender’s name when sending and preview, to name a few. 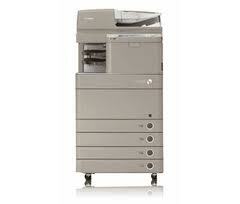 It is a color digital all-in-one printer that prints, copies, scans and faxes. It makes use of an 8.4" SVGA high definition, full-color, TFT Screen operational panel that gives ease of use. It has a standard memory of 80 GB, which can be maximized to 250GB. It measures 37" x 24-3/8" x 29" and weighs 342 lbs. Its standard paper capacity consists of dual cassettes of 550 sheets, a bypass tray for 100 sheets and optional dual cassettes of 550 sheets. Its paper deck holds up to 2700 sheets. It has a maximum paper capacity of 5,000 sheets, with a standard inner tray with a capacity of 250 sheets and a maximum of 3,250 sheets that come with a stapler finisher. It supports a wide range of media with sizes of 12" x 18", 11" x 17", legal, letter, statement, executive, custom (5-1/2" x 7-1/8" to 12" x 18") and envelopes. Canon imageRunner Advance C5030, with its features and functions, gives a more simplified yet productive workflow to small workgroups and small departments of any office. With a simple touch of a button, you can, easily, gain access to either regular printer tasks or more complex printer functions. It can function as printer, a digital photocopier and a document scanner and these are simple to do, making it suitable even for those who are not adept with this type of equipment. It enables digital file sharing and comes with professional finishing options. It, also, gives you control over costs with features like auto duplexing and scanning directly to sources such as a PC or an email, which lets you, cut down on use of paper. Moreover, it lets you manage secured information with its security features. It prints with rapid speeds and produces high quality output, making it ideal for creating the professional documents an office requires. It is reliable and efficient to finish print jobs with exceptional quality, in no time. There is more than enough proof regarding this in the Canon imageRunner Advance C5030 Printer review. Simply click here to return to Photo Printer Reviews 2011.